There are just so many items that Saizen has to offer, and I'm not really surprised. After all, the Japanese are popular for inventing and manufacturing all sorts of things that you need and don't need at the same time. For this post, I'm going to share my top favorite makeup artist finds from the store. I'm not sponsored in any way to do this post (or any other of my posts hahaha), it's just that while I was at makeup school, the school was in a mall and Saizen was a mere 15 second walk from school that I frequented this store while in school. I frequented this store so much that I've more or less familiarized myself with their product line, the knick knacks, and the really useful and value adding things they sell. Moreover, I also noticed that a lot of the stuff that the school had were bought from this store. And there have even been times that my teacher went to Saizen to make a rush purchase for items the school doesn't have! Main post after the jump! 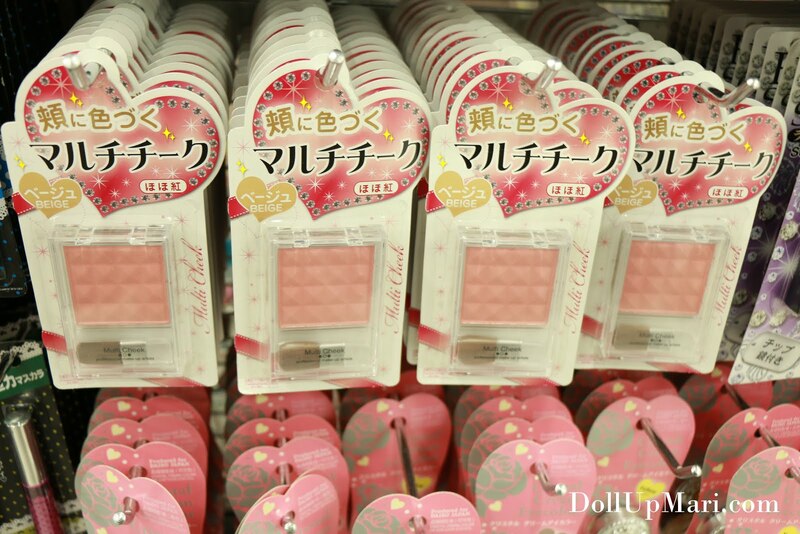 Saizen is the original Daiso store or the 100 yen store chain in Japan. 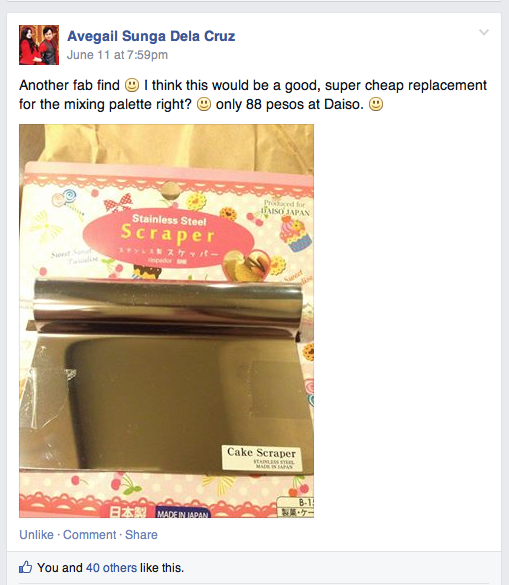 Since another business entity in the Philippines used the name daiso for their stores, they had to use another name. But they sell the same stuff you can find in Japan's Daiso and Hong Kong's Jusco. In fact, I've encountered several instances that I've seen items recommended in Japanese magazines in real life at Saizen! All the items are Php88, with some occasional sale items going down to Php44, and some clearance items sold for Php25 or Php10. 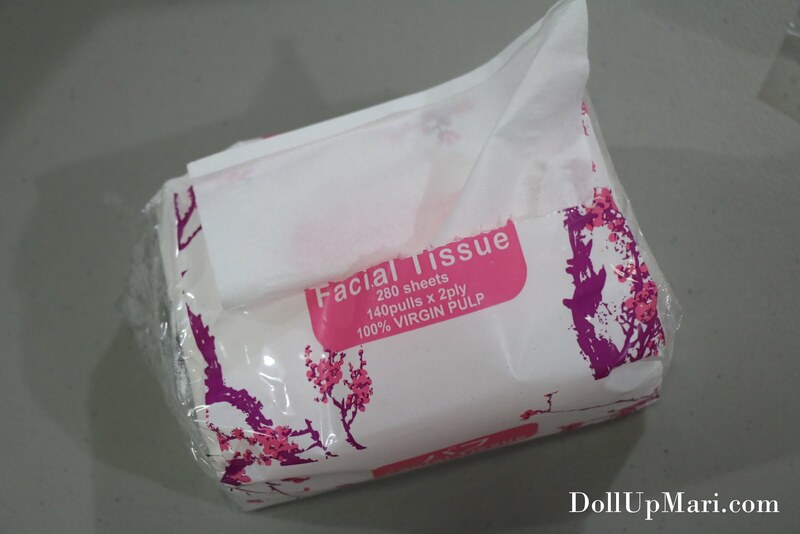 As in I cannot express how much I love their facial tissue packs. You see that five pack bag? That's only 88! In other words, that almost 1200 facial tissue pulls for Php88! If you're a random citizen this may not feel like a lot of savings, but if you're a makeup artist who uses at least 10 sheets of tissue per client per session, this is really a big big help to the budget. They're so affordable that I use this for cleaning my makeup, cleaning the tables, whenever I have a cold, and virtually all the times I need tissue paper! Maybe for tissue conoisseurs, this will probably feel marginally rougher or tougher, but I do think that for most people, this is already soft enough to the touch. I am also in awe that it's not only the tissue that's so cheap but also these cotton pads. 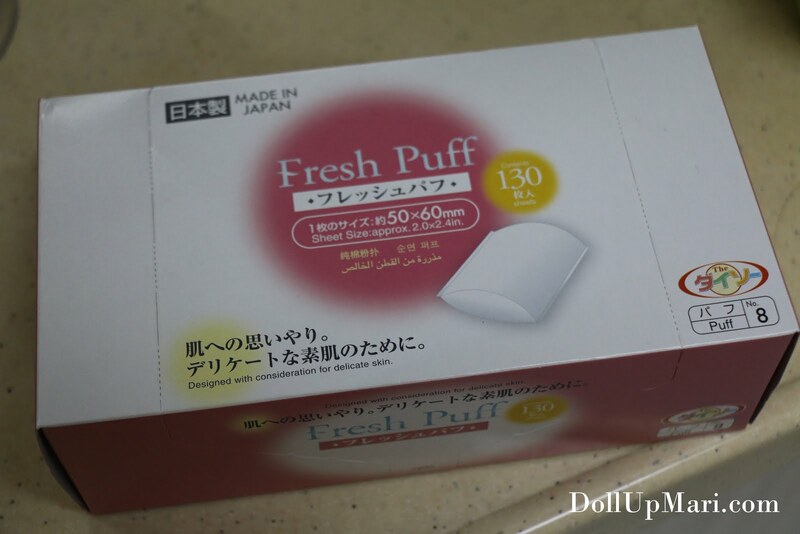 It's very common to see cheap cotton balls, but I think a lot of people can relate with me that the same is not true with cotton pads. This Php88 got me 130 pads, and at times, there are even packs in the store that have 180 pads in them! This is really useful in removing eye makeup or when using an expensive fluid (e.g. pricey makeup remover) because it's thin and with a larger surface area that you can distribute a small amount of product to the whole pad for a larger surface area in cleaning or applying product. And honestly, I have this in my kit just to make clients feel fancy. I have no idea why, but it's these pads that make people feel pampered hahaha. 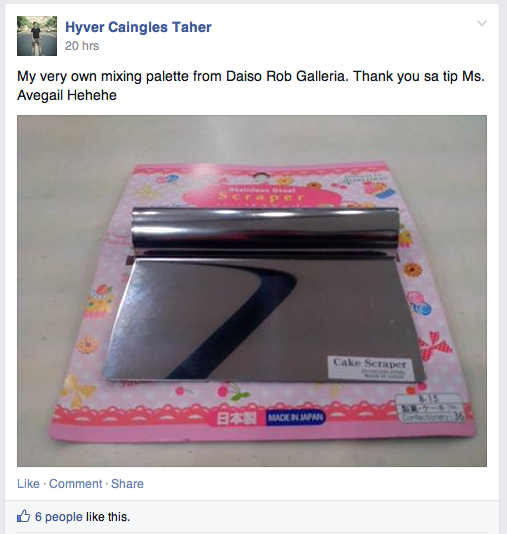 I was browsing a makeup artist forum on Facebook and I was positively surprised that someone turned the cake scraper of saizen into her makeup mixing palette. The great thing about this is that since it's just Php88, it doesn't feel bad to toss it out when it's already gotten a lot of scratches. A makeup palette with a lot of scratches of course looks unpresentable to a client, but if your palette is those expensive Make Up For Ever/Suesh/Monda Studio ones, tossing them out is just not an option. I personally own an acrylic palette and use an artist's spatula which causes less scratches, but I feel that this is a good buy for those who are using metal ones. And even then, acrylic ones aren't cheap either. If I still didn't have a palette then I saw this, I honestly would consider this idea. And yes there are followers now hahaha. 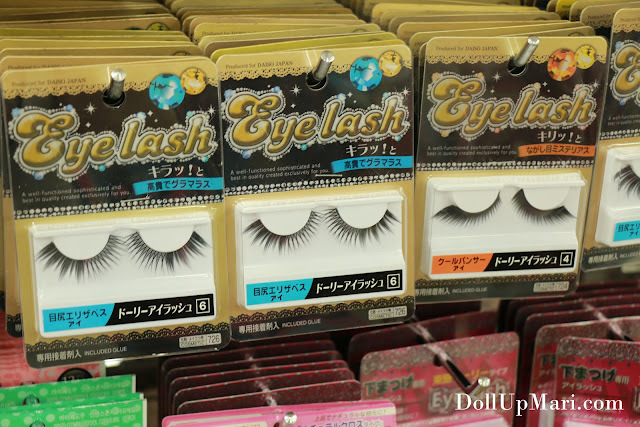 They have the best eyelashes for doll looks, Marilyn Monroe and Twiggy looks. I also love that they have a lot of choices for evening parties and all. Their eyelashes aren't the cheapest at Php88 for 1-2 pairs, but if your clients are paying well, and if they're going for a glamorous look or Japanese mesmerizing eyes, you'd surely find something good in Saizen. And may I add that they're probably the only store in town to sell lower falsies for Php88 a pair, a good price if you ask me. I am aware that not a lot of people do gyaru looks and that lower lashes are more useful for doll looks and some other costume looks, and the fact that they have them at the price of Php88 is comforting in the world that sells lower lashes for Php300 or more. 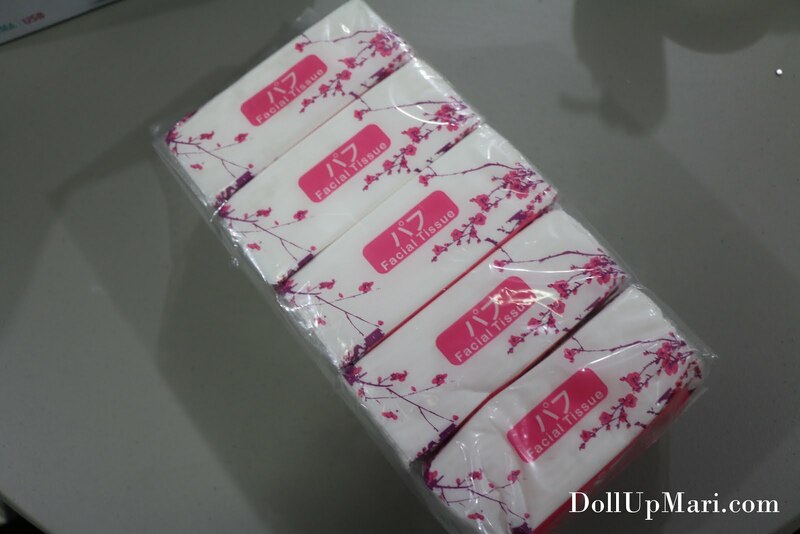 I love my Dolly Wink lower lashes, but I'm also aware that not many people will be willing to pay Php700 for 2 pairs of lower lashes. If you are in need of cheap eyebrow shavers that work, this is the right place to go. By far they're the only place I've seen selling 3 shavers for Php88 that actually work. I've tried the Php16-25 ones in SM Dept. Store and Landmark but to no avail. I like that they have really cheap shavers that I can keep on replacing them both for hygiene purposes and for when the blades start to get blunt. 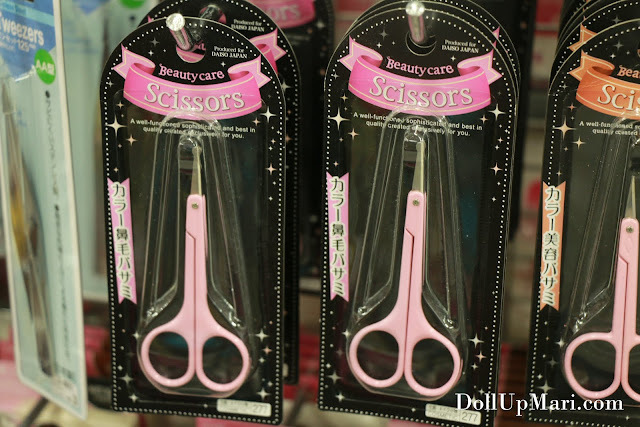 As seen here, they also have safety scissors for trimming eyebrow hairs, and possibly for cutting false eyelashes. I have not tried their eyelash curlers yet, but if you are going to a gig where you are going to be doing it for free, it might be better to get the rubber pads on these affordable curlers worn out instead of the rubber pads on your Shu Uemura eyelash curlers. To add, they also have eyelash cases (the black and pink boxes on the bottom of this photo), and eyelid tape and glue for those who want to make their eyelid creases bigger or for the monolids who want a quick fix. If you need a cup holder, a mini trash can, a box, an aluminum box with cover, and virtually any kind of packaging you'd need to store your makeup, please, by all means, shop here. 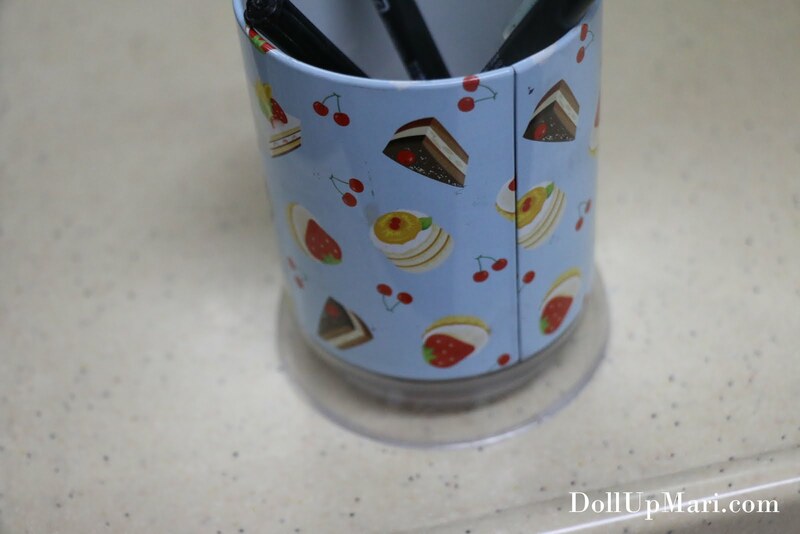 This is a cup holder which I got for Php44. Not very classy looking, I know, but it's better than bringing a drinking glass which may break in transit or a fancy leather brush cup which may get scratched or damaged in transit. I also love this cup in particular as it's very sturdy and even if I put long and heavy brushes in it, it won't topple over. I also like that it's got a metal body and a plastic bottom so that even when it's placed on a moist surface, it won't rust very quickly. 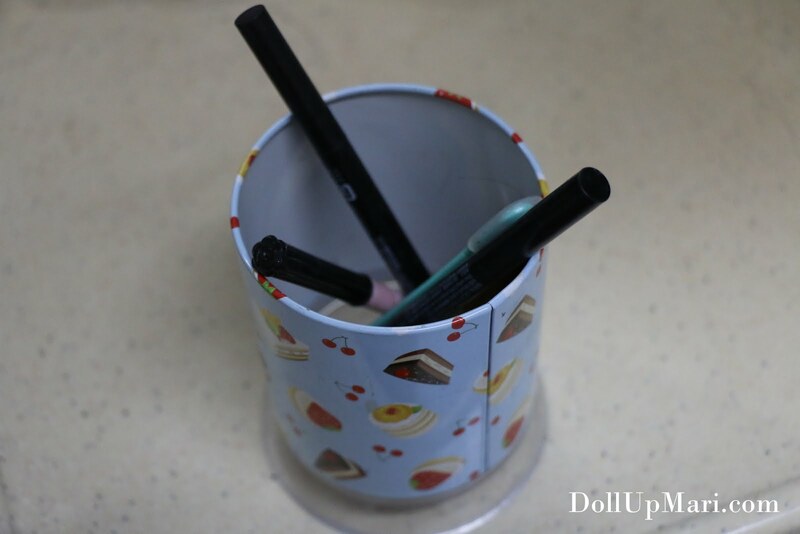 Incidentally, in this cup are 2 of my eyebrow pencils (the black ones) with spooleys on the other side, and my light brown eyebrow pencil (black cover, pink body) and my eyebrow shaver (green, from 3 for Php88 pack), all from Saizen. 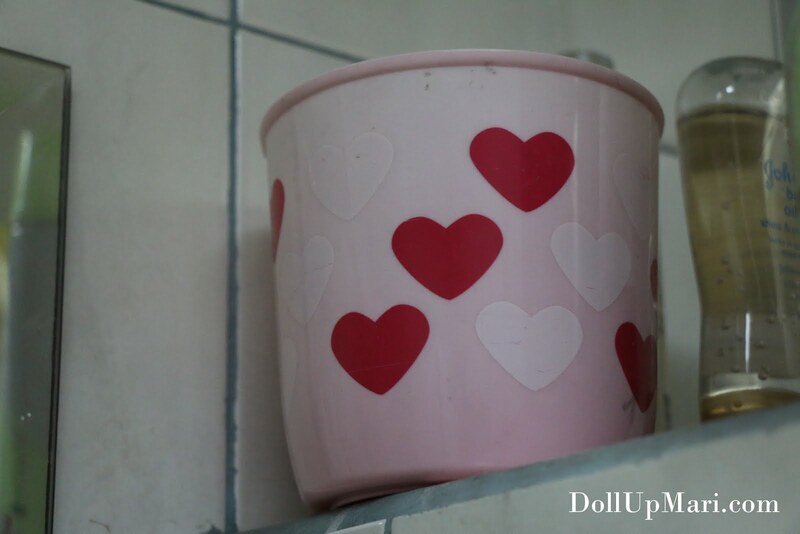 This is my mini trashcan/ cotton ball bin/ brush holder when I'm soaking my brushes in conditioner. The plastic is slowly breaking and cracking now, but I'm not complaining as I was able to use this a lot throughout the year it's been with me. As of now I can still use it anyways so it's still not yet considered useless. I of course use more high end stuff like Urban Decay and Make Up For Ever on my clients, but for those pro bono jobs I'll be doing for people whom I'm not close to, I like that I can buy affordable but decent and safe makeup from Saizen. 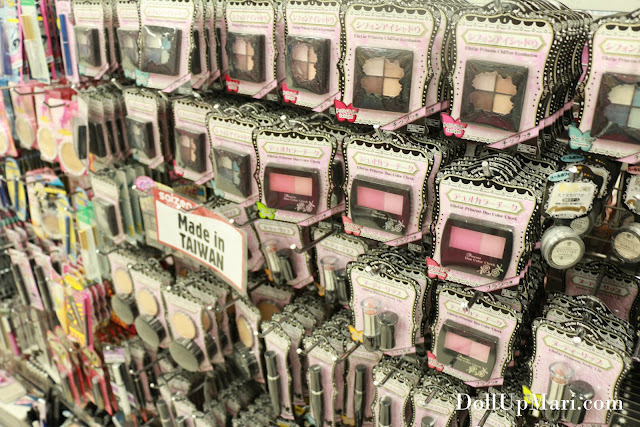 They have a good selection of eyebrow pencils, face powders, and cheek products. This is just a list of my top favorites, and there's waaay more stuff in the store that makeup artists would like. In fact, a lot of you might find your own favorites as well!